Hope, you all had great easter. 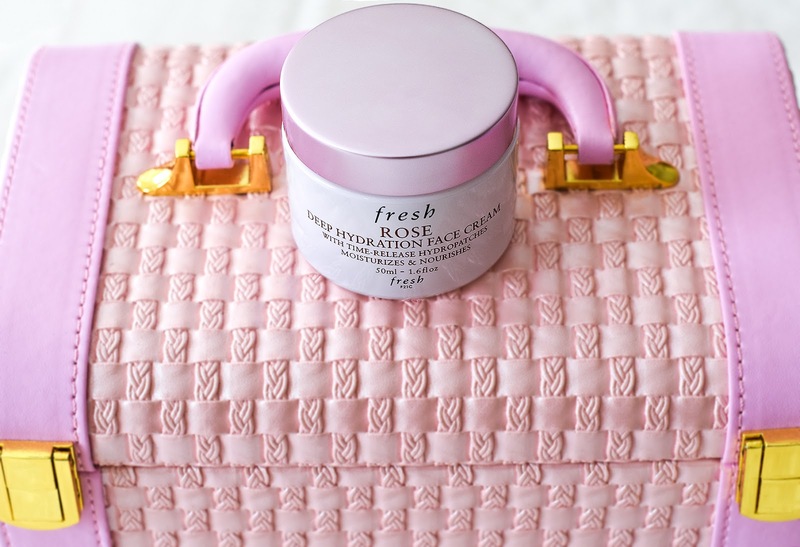 Today I want to show you a new addition to my everyday skincare routine __ Fresh Rose Deep Hydration Face Cream ($40). Since my L'occitane Shea Ultra Rich Comforting face cream was way too heavy to wear under my makeup (you can read my review here _ L'occitane Shea Ultra Rich Comforting face cream review), and my Lancome Energie de Vie Water-infused lightweight moisturizer was irritating my dry, sensitive skin, I was desperately looking for a new, lightweight moisturizer for my face. Other day, I was at Sephora, and I decided not to leave the store without getting a new moisturizer. I was adviced to give this Fresh Rose Deep Hydration Face Cream a try and since its description sounded promising, I bought it. I also got a sample of Fresh Seaberry Moisturizing Face Oil but it didn't work for me, it irritated my skin and gave me some rash. This Fresh Rose Deep Hydration Face Cream is a lightweight gel-cream, "infused with soothing rosewater, antioxidant Vitamin E, and nourishing rose flower oil that delivers intense 24-hour moisture." It's for normal to dry skin. This is a really lightweight moisturizer, it has pleasant rose smell that goes away after few minutes. I apply it in the morning, it feels very fresh and hydrating for a few hours but definitely not for 24 hours like it claims. In the evening, my skin needs some extra hydration again. For conclusion, overall, I like this Fresh Rose Deep Hydration Face Cream, I will keep using it under my liquid foundation, but I will not repurchase it again because my dry skin (especially in winter and early Spring) need extra hydration and this cream is not enough. I believe it would be better for normal skin not for very dry skin like mine. Have you used this cream yet? Let me know in the comments below and have a fabulous day. I haven't tried this. What does it smell like? Rose? Or a different scent? It smells like a rose, it's not a srong smell. Have you considered using a hydrating Serum underneath your moisturizers? They really pack a punch in terms of ingredients, but aren't as heavy. I've tried a few serums but I haven't found a perfect one for my dry, sensitive skin. Which serum would you recommend for sensitive skin? Looks great, I love rose! 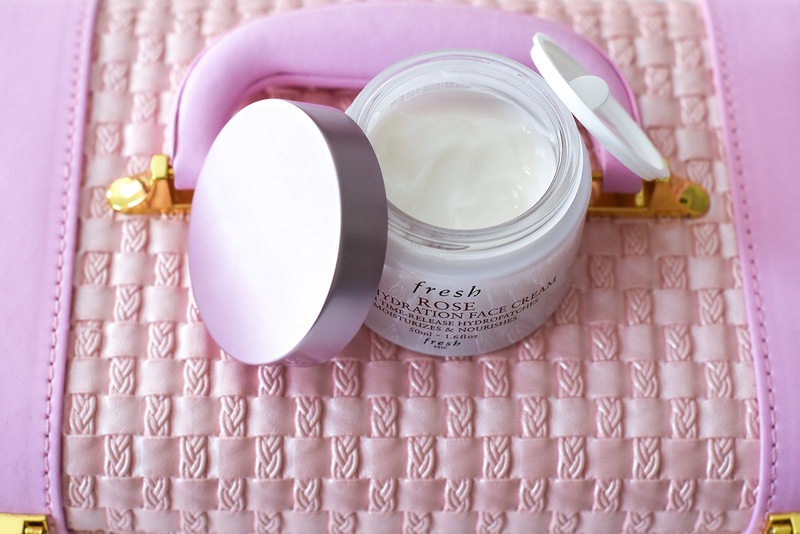 I haven't tried this moisturizer but I really do love Fresh's line of skin products! I'm going to be looking for a new moisturizer in the next few months, so I was planning on checking out their moisturizers. Thanks for the honest review! I love Fresh products! Thanks for sharing and I hope to try this soon. Haven't tried it but sounds great. Although you won't be re-purchasing, the lightweight texture sounds great and I can imagine how gorgeous it must smell! Like you say though, it's a pity about the lack of SPF. Try adding a drop or two facial oil with your moisturizer, Nina or as Anne suggested a hydrating serum. I like Bioderma Hydrabio Serum, it's lightweight and hydrating. I've never heard of this brand before. Thanks for sharing! I've never tried anything from Fresh before but this sounds lovely! I have oily skin though so that's probably why but I can see why you might like something more hydrating! Sounds like a lovely cream to try but I have to admit that the price is a bit too much. I personally wouldn't pay that for a cream without SPF simply because my skin goes crap if I don't use it. I am such a skin care junkie, so I totally enjoyed this review. The texture sounds amazing, it's a shame that it doesn't seem to hydrate dry skin enough. I would suggest using a serum or an oil underneath to incorporate more hydration. It sounds lovely, although it's a shame it's not as great for your skin as you'd hoped! It's good you can still get some use from it though. I love the sound of this as rose products are my favourite. Hope you have a great start to your week. I haven't tried this product yet but I've used their Umbria Clay Mask which I will review soon in my blog. Great review! Love seeing what fellow bloggers have to say about different beauty products. I love rose scented things! I tend to use a separate SPF to moisturiser because I can't find one I like that already has it in! I love a moisturizer that absorbs quickly- I hate having to wait what feels like forever for it to sink in so that I'm not all sticky. Great review, lady! It sounds like a great product for a different skin type; I'm sorry it didn't really work out for you as you would've hoped for. Thanks for sharing your thoughts with us and I hope you're having a great start to your week so far! Great review! Thanks for sharing, babe! Thank you for your honest review, this is indeed expensive and it would be suitable for normal or combination skin, too bad it is not moisturizing enough for your dry skin. Your photos are gorgeous. I haven't used this product before but like that you state it has a light floral fragrance rather than something too overpowering. I have to admit, as I am now the wrong side of thirty I do prefer products with SPFs. That looks and sounds really great!! I need to try this!!! Thanks for sharing! Thanks so much for your fair and honest review! I love Fresh products, but I definitely need SPF - maybe this would be a good pick for night cream! I love beauty products that are rose-scented because they smell so good. I need hydrating products. It's super hot and humid nowadays. I've never heard of it before, but that's a shame it wasn't hydrating enough! Haven't hear of this one before. Thanks for sharing, babe! I would love to try this lotion on, I looks like it works super well! I don't think it will work for me because when my skin is really dry it's flaky so I need something with a lot of hydration. Thanks for the review! I haven't tried this one, but I didn't like that oil either. It did nothing for me. I love Ole Henriksen's Sheer Transformation cream a lot, its at Sephora. Thanks for sharing!